I have been waiting for you so long… The expectations are high but I have claimed you as the best year ever! I am sure you won’t disappoint me and we have so much to do. I am looking at you with a twinkle in my eye, with the love and expectation a lover feels. Just like love, you are never sure what will come next. So far and unexpected event have thrown me where I refused to go; I lost my beloved Maxi over Memorial Weekend, my Miniature Pincher of 11 years, it was unexpected and fast. The hurt and emotions ran deep as I made the decision to end her pain. For the first time in my life I didn’t want any other dog in my life, at least not for a while. Everything had changed so much in the last 2 years that I was kind of shedding everything than in one way or another was holding me back. Life did a lot of elimination on its own and others I did myself. When my son Josh came to visit over this Christmas season he kept asking me to go get another dog, I refused. I would not dare go there again, just the memory of Maxi hurt. I am busier than ever, working and building a retail business on the side and I am content with that. I miss the time I used to dedicate to reading and writing but it is all part of not wanting to touch the chords of my heart for a while. I am wounded and I am not sure how to heal. On New Year’s Eve we got together with my family and had a great time. When we were ready to go I was reminded of my loss again, my cousin handed me a Christmas card with a picture of her family, including her dog. I told her about my loss and there it was, the pain again. I had not idea that minutes later I would be faced with a scared, injured dog at the gas station we stopped on the way home. The kids jumped out of the car, I started to tremble. I saw him from afar but I would not dare get out. My jaws clenched, my heart was going faster. They all went crazy with the dog, the asked the attendant about it, they grabbed it, they asked me to take it, I would continue to say no. They insisted, how could I leave him? Before I knew it my daughter put him in her car and we drove off. I don’t even remember the million thoughts that went through my mind as we drove one more hour before we reach our home. As soon as we arrived I left with him to the clinic, my son accompanied me. I had to decide to leave him there or take it home. It was very likely that he would be transferred to his county and wait for his owner to claim him but since he was injured if nobody did he would be put to sleep. I could not walk away. As I stood there thinking what to do and a rush of emotions came over me, it was the same clinic I took Maxi into, the same room where they gave me the bad news of her massive infection and I ran off home with her, just to bring her back hours later and having to say good-bye to her. I burst into tears, Josh embraced me, it had been couple of months since my last cry over her. I decided to give this dog a name and take him home. Today is 4 days later and we have not been able to fix his leg, he needs surgery and I am at the bottom of what I could spend. There is no financial assistance anywhere for this, it’s outrageous. We should have more vets and surgeons dedicating some of their time on this kind of charity. I am running a fund-raising event on Facebook with my family and friends, some have come forward but we are so far off the amount I need for the surgery that all we will be able to do is to redo the splint and try to align the broken bones and hope they heal good enough. It will be less costly but I really don’t have anymore money than those donations. If you would like to contribute to the fund for Troy you can go here. Anything at all you can give will be greatly appreciated. I don’t know what else to do and pray that somehow all the expenses are paid because if God put him on my path, it was for a reason. 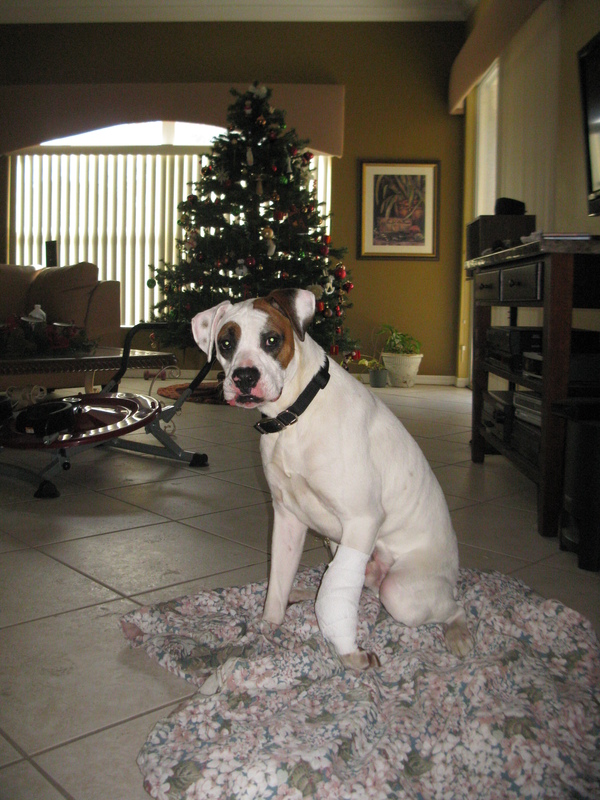 He is such a loving dog and he is so happy that you would never think he is badly hurt. He is healthy otherwise and deserves to have a good happy life. So here it is, meet Troy! Glad to hear your optimistic hopes for 2011. And it seems the year is starting with a challenge that brings out the best in you – strength, determination, perserverance, and compassion to name a few! Thank you Sam, never thought of that. It has been very intense moments trying to keep this dog alive. Thanks to the generosity of many he is still around but there is still a lot to do and money to raise for all the expenses.